A neighborhood is hoping something can be done to crack down on the wild parties and satellite trucks at a suspected short-term rental property near Desert Inn Road and Rainbow Boulevard. "It's not legal," said one neighbor who declined to be identified. "We have a Strip for that, why do you have to bother my neighborhood?" she added. Many neighbors are afraid of possible retaliation for speaking out. The home in question located in the 7000 block of Palmyra Avenue has been posted on short-term rental sites like booking.com for nearly $1,500 per night. The posting features a resort-style pool and plenty of bedrooms for large groups. The website says the property is currently not taking reservations. Clark County officials confirm they are actively investigating the complaints because short-term rentals in unincorporated Clark County have been banned since 1998. 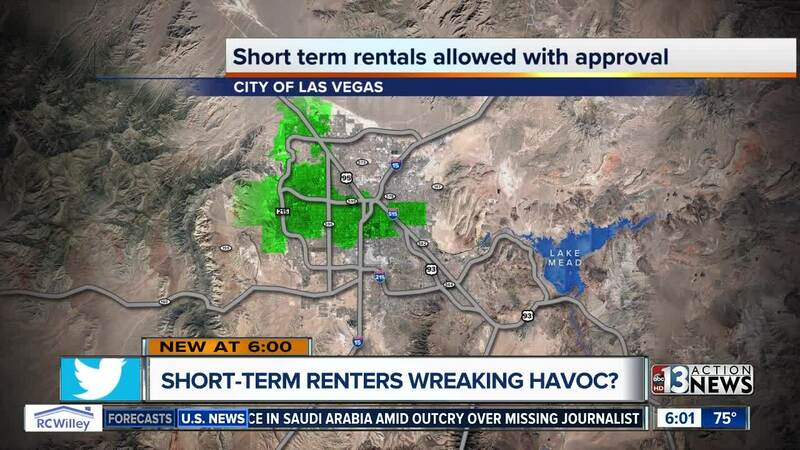 According to Clark County property records, the home is also connected to another suspected unlicensed short-term rental property within the city of Las Vegas. "There has been a lot of trash that took a while to be picked up," said Jackie Maloy. Neighbors say piles of trash in front yard of the home located in the 1400 block of South 6th Street are just another indication of just how many people swing by. The city of Las Vegas does permit short-term rentals if they are approved by the city council. Las Vegas city officials confirm the home is not a licensed short-term rental, but code enforcement has been monitoring the property for rental activity. So far, investigators have not observed illegal rental activity since July. 13 Action News knocked on the door of the home and we were told the owner was not available. The city of Las Vegas is considering a ban on short-term rentals but a potential date has not been set.